Every year has its noteworthy events, and 1952 was no exception. In February in the U.K., Elizabeth II became Queen of England upon the death of her father, King George VI. In May, also in the U.K., the jet age of travel was born with the introduction into service of the world’s first passenger jet, the ill-fated de Havilland DH 106 Comet. In July, in Helsinki, Finland, the Games of the XV Olympiad were held, with athletes from the Soviet Union and the Peoples Republic of China competing for the first time. In November in the U.S., retired General Dwight Eisenhower defeated Illinois Senator Adlai Stevenson, becoming the country’s 34th president. Three days prior to Ike’s election, the U.S. detonated the first hydrogen bomb on Enewetak, a remote atoll in the South Pacific. In Saudi Arabia that same year, meanwhile, King Ibn Saud was nearing the end of his long rule as the founder of the Kingdom. Nineteen fifty-two was a pivotal year as well for Verne Stueber, Badge Number 15172. Verne was trying to figure out how to increase his income and pay back the student loans that had funded his chemical engineering degree at the University of Wisconsin when Aramco offered him a position in the Kingdom. Verne gladly accepted and moved to Arabia, where he served the company for thirty-five years before finally retiring as Manager of Manufacturing and Oil Supply at ASC Houston in 1986. 1950s Dhahran Singles Reunion are (l-r): Jopie DeVries, Fran Mealy-Grant, Theo DeVries, Ken Wright, Ruth Wright, Carol Keyes-Rader, Verne Stueber and Bob Grant. Photo courtesy of ASC and Al-Ayyam Al-Jamilah. 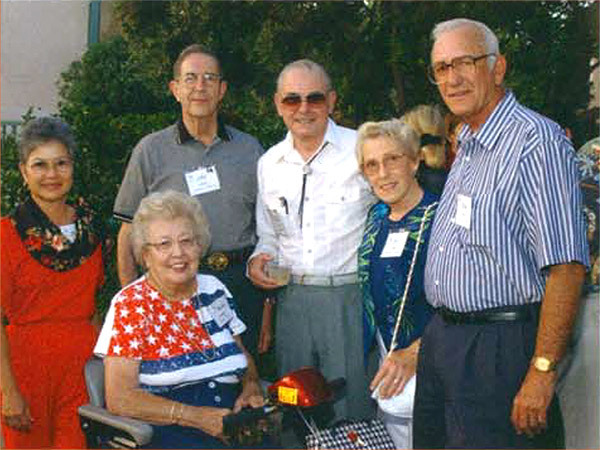 Among friends: Joyce and John Bauer, Becky and Verne Stueber, and Ann and Allen Tabor. Nurse Becky and Engineer Verne lived a full and rich life together, splitting their time in the Kingdom between residence compounds at RasTanura, Abqaiq, Dhahran, and Udhailiyah and raising four children—Mark, Michael, Matthew, and Kathy. Their children, in turn, blessed them with three grandchildren—Gabel, William, and Adriana—who since have further blessed them with great-grandchildren. Retired and living in Texas, Verne has been active in Aramco annuitant events in the Houston area, at one time organizing their annual holiday banquet for seven straight years. He continues to serve today as co-secretary for the Aramco retirees in the Greater Houston area. Earlier this week—on the 2nd of July—Verne turned 90. AXP extends its warmest personal regards to Verne on officially becoming a nonagenarian. 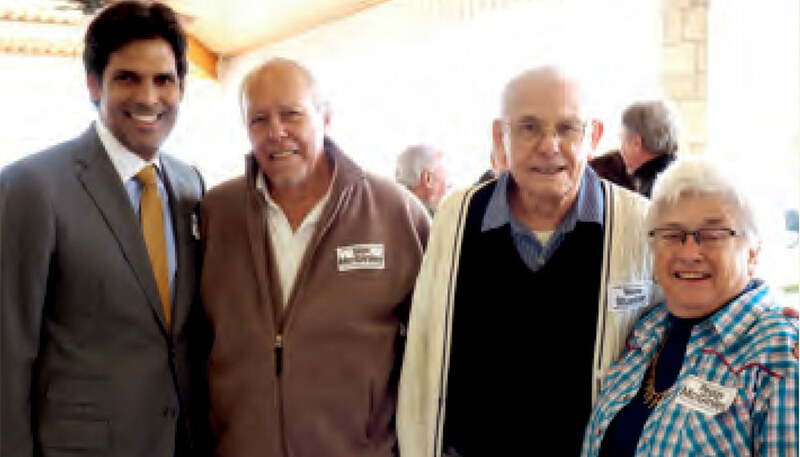 Pictured on the patio at the McGinley Family Ranch and Vineyards are (l-r): Nabeel Amudi, then the president of Aramco Services Company, Stan McGinley, Verne Stueber and Peggy McGinley. Readers who would like to congratulate Verne can reach him by email at [email protected]. His physical address is 431 Cherry Laurel Drive, Tomball, TX 77375 United States.